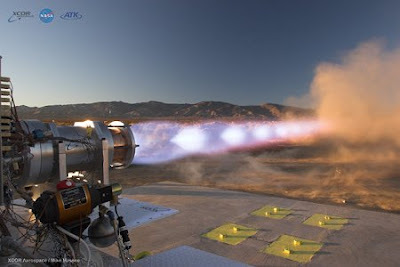 The photo shows a methane engine for future spacecraft being tested in the Mojave desert. If successful, this will be the first time that methane will be used as fuel for space travel. One advantage of using methane fuel is that it is plentiful in the solar system and may be harvested from one planetary object to another as a spacecraft voyages. Upon leaving Earth, the spacecraft would not have to carry heavy fuel, which would lower the costs of a mission. Project manager Terri Tramel of NASA's Marshall Space Flight Center (MSFC) says several efforts are underway, including a LOX/methane main engine design by KT Engineering.